Creating the most powerful Rocky Horror EVER! We REALLY stepped up "the reactor power input" and brought you Rocky Horror on the highest energy site that it's ever been performed at. 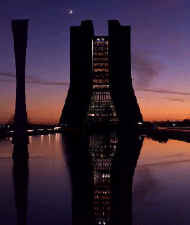 Halloween 2001; A great tragedy - we were scheduled to reprise our performance at FermiLab. Unfortunately, due to the terrorist attacks on the World Trade Center of September 11th, 2001, and the sensitivity of the work that is done at the National Accelerator Laboratory, security concerns forced FermiLab to close its gates to the general public for the next eleven months. Rocky Reborn! For we returned to FermiLab and brought Rocky Horror back to the audience that so warmly received us two years ago. We were scheduled to perform there, but due to a series of unfortunate circumstances, the show ended up cancelled. We're the performing cast for "FermiLab" in Batavia, IL. They operate the world's highest-energy particle accelerator (until 2008), the Tevatron. The laboratory also boasts a wildlife sanctuary and cultural arts center - where we bring RHPS to an audience that probably would never see it otherwise. They have tours and are open to the public. It is highly recommended if you are ever in the area and find this kind of thing (you know... like, science and stuff...) interesting.